Norwegian band Los Plantronics move farther into the fuzz, and bring in more mariachi horns as well. Aggressive lead guitar, throbbing vibrato second guitar, and excellent bass and drums, with tasty organ as well. While some tracks are riff rock, most are well crafted capsules with solid writing and hard driving playing. Tuff instrumentals, plus a few vocals, including "Let's Lynch The Landlord," the Kinks' "I Need You," and Johnny Cash's "Ring of Fire"
Los Plantronics jumps right in with a rousing rendition of Enio Morricone's "Hang 'Em High." The arrangement is like a merger between the Bottle Ups and a film score. The throbbing vibrato and jaws harp are very cool. Hard driving rock and roll instrumental throb. Not very melodic, but very pumped up. Thick and fuzzy, and full of edge. Davie Allan and the Arrows aka Max Frost and the Troopers' fine tune "Shape Of Things To Come" is slightly defuzzed for a hot and drum-powered rendering. An uneasy spy riff drives this menacing track. Thick and powerful, "Beatnik Bandolero (Is Coming To Town)" squeals with delight as the hard driving drums and bass pummel the masses. The style is a little like eighties guitar instros, but updated. Nasty tone, relentless danger, and bull-bodied threats to tranquility abound in this track. It has some interesting spots, but it's also too repetitious for my taste. "Mustang" is a progression based tune with a light fuzz lead, throbbing vibrato rhythm, and a whirling organ fill. Sorta eerie, kinda dangerous, and pretty thick. John Barry's "Goldfinger" gets the big guitar fuzz treatment. Loud and large, but not really very interesting. Big drama and mariachi horns, a cool melody and a Mexican fiesta scene. 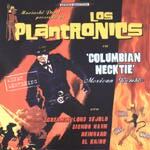 "El Hombre" is a very cool tune, blending traditional elements with modern rock instro structures. The slower more dramatic section is like an afternoon at the bullfight. Bash, crash and bang! John Wayne - Drunk Again? This silly hickoidal nonsense just churns a rhythm and pretends to be a song. Chunk and chip at the ranch... kinda hokey and playful, like Eddie Angel gone awry. What would happen if Link Wray wrote Pushin' "Too Hard?" "Signor Link" answers the question. Big fuzzy fast and way cool in a weird sorta tribute way. The insane guitar effects and extra crunch make this a real battle zone for guitars.